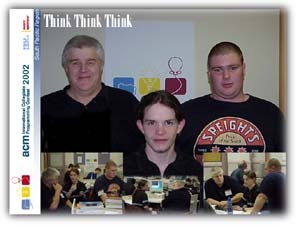 The 2002 ACM South Pacific Programming Contest sponsored by IBM was held on Saturday 21st September at 9 sites across Australia and New Zealand. 101 teams competed for the chance to represent their country in the World Finals next year. This year we had our largest competition ever, with 12 teams competing at the Adelaide site (up from 9 last year). Specifically, we had 3 teams from the University of South Australia competing for the first time (thanks to the efforts of the UniSA coach Stewart Itzstein), as well as 3 from Adelaide University (thanks again to coach Brad Alexander) and 6 from Flinders University. The contest started right on time and ran without a hitch. Thanks to the hard work (and early-morning start) of Site Technician Trent Lewis, PC2 behaved beautifully. And thanks to the prompt and careful work of judges Brad Alexander and Stewart Itzstein, with help from Assistant Site Directory Carl Mooney, the judging also proceeded smoothly. Our first correct submission landed on the judges' desk 17 minutes into the contest, with other correct submissions hot on its heals. In fact, the judges were kept rather busy for the first hour, with 16 correct solutions accepted by that time. Teams found problems 1 and 3 easiest, with most teams earning their red and yellow balloons fairly early. Incidentally, the balloons idea worked well; by the time the pizzas arrived around the mid-way point, the contest rooms were looking quite festive! The pace dropped off considerably during the second half of the contest as the teams tackled the more challenging problems. After 2 hours we had 25 correct runs (including 5 from one team! ); in the last 3 hours, only 13 more correct submissions came in (including 2 during the last minute!). By the end, all teams had at least one correct submission, and our best team had 6. After their humiliation at the hands of the Flinders teams last year, Adelaide was triumphant this year, taking out the first 2 places and thus being the inaugural winner of the Golden Ukulele, our newly instigated perpetual trophy. Flinders took third place, and UniSA contributed the best second-year-only team, so everyone had a share in the success. Overall, most people reported that they enjoyed the day, found the contest worthwhile and stimulating, and would be interested in competing again in future. From the university's point of view, we were very happy to be involved in the contest and have every intention of hosting again next year. We had 17 teams competing at the Auckland University of Technology this year. The home university and our neighbours at the University of Auckland competed, as did teams from the University of Waikato, Victoria University in Wellington, and Massey University's Institute of Information Sciences & Technology. The proceedings were opened by Professor Steve MacDonell of AUT. Registration was conducted by Peter Kaye and Firas Al-Ali. Our site technician Art Brown worked hard to get the machines ready in time (the lab we were using was open to students until 7pm Friday! ), while the judges Michael Dinneen, Radu Nicolescu, Bill Rogers and Tony McGregor made their final preparations. Boris Bacic took photographs of all the teams. The first submission arrived after about 10 minutes, and the judges were kept busy most of the afternoon. Gordon Grimsey and Nurul Sarkar helped in the contest lab, and with the distribution of pizzas afterwards. 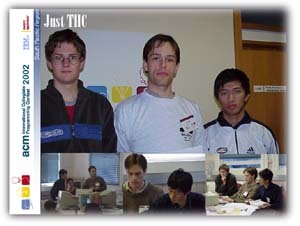 Congratulations to the site winners, void from the University of Auckland, who are also the New Zealand champions for 2002. Every team managed to solve at least 2 problems, so well done to you all! Thanks to everyone who helped, especially to Art for the huge amount of work he put in on the day and into the early hours of Sunday morning! Five hours to do what amounts to about a years practical work; the ACM programming contest is certainly the right place to look for keen programming students! As always, it was a long, hard, exciting, adrenalin filled day. Thirteen teams from four Universities took part, and all the teams deserve full credit for their work and their achievement. The race began about fifteen minutes late, with the first solutions coming on-line an incredible five minutes later. As each new correct solution came on-line, it was acknowledged with coloured markers on the successful terminals, and it was not long before the two rooms were a small forest of markers. About an hour into the contest, teams were working on harder problems which stretched their ability and the frantic pace slowed a bit, but there was always a steady stream of submissions, and the PC2 judging software certainly streamlined the whole submission and response system. The early leader, "Class Act" from the University of Queensland, dominated the field from the very start, and went on to take out Brisbane honours with six problems solved. "UQ E" also from the University of Queensland came second, with four problems, and "The Simpletons", of Bond University, placed third with three problems. Leading teams from Griffith University and the Queensland University of Technology also solved three problems each. The success of the day owes much to judges and helpers, and also the coaches of all four Universities for coming along to help on the day. Grateful thanks go to Dominic Cooney, Sartaj Singh (QUT), Rodney Topor (Griffith), Phil Stocks, Andrew, (Bond), and Jamie Shields (UQ). Industry support is also essential. The contest sponsors, IBM, enable the whole contest to occur, also supplied prizes and other giveaways. The entry fees for all teams at the Brisbane site were paid by GBST, an Australian company developing software for on-line financial and stock transactions. Thanks to everyone involved, and just wait till next year! This year the Canberra site had four teams competing from the ANU. All the teams solved the first three problems quickly. However, from this point on the task before the teams became considerably more difficult. Problem 4 cause difficulties as the programs submitted, although produced the correct results, were an order of magnitude too slow for the test data. ANU 42 managed to get 4 problems out. Yet, once again "Implausable Solutions" came out on top solving 5 problems. Overall the contest ran very smoothly, with the pc2 software not causing any problems. Many thanks to Bob Edwards for organizing and setting up the computers and their environment(and for getting the pizza!). Overall everyone concerned found this a challenging and enjoyable day. The contest went fine, after a few initial glitches with PC^2 were sorted out. Stewart Fleming (Technical Director) left after setting the contest up to run a half-marathon, leaving the contest in the capable hands of Nick Meek. Stewart returned briefly between the race and the prize giving to clear up a few minor printing problems and then returned later to help stop the contest and create the files to be sent to the chief judge. In the mean time Ken Sutton from SIT and Chris Handley judged and judged and judged. Thanks to all the teams who participated, in particular to those that travelled from Christchurch and Invercargill. Congratulations to 'Just THC' from Canterbury, worthy site winners and also to 'Think Think Think' from SIT who came 23rd in the region, 10th in New Zealand and 3rd in Dunedin. This year's event went smoothly in Launceston, despite some difficulties in the Friday practice session in which a weird PC^2 artefact cropped up. Although we started a few minutes late due to a briefing overrun, submissions were hitting the judges earlier than usual from the site record number of teams. In terms of site results, things went much according to form. Although "The Adam + 2" (Adam Eijdenberg, Patrick Cranney and late sub Christian De Kievit) were fastest out of the blocks and ultimately finished second on the site, it was no surprise when "Deja Fu" (Michael Horton, Andrew Stevens and Jonathan Adamcziewski) sprinted past them within a few minutes and ran away with the site championship, also topping the region for most of the event. Meanwhile other teams were quietly getting on with their own work, taking an eternity to find a superfluous space, etc. All teams are to be congratulated on their efforts, and "Deja Fu" in particular for their performance, with Michael Horton "three-peating" as a Site Champion and repeating a regional 4th. Tony Gray (Technical Director), Robyn Gibson (Judge), Andrew Spilling (Technician, Pizza Orderer, etc. ), Christian McGee (Technician), Ian Lewis (Judge). The room was packed with people when we started the briefing. We had 19 teams competing in the Sydney site this year. We had 10 teams from University of New South Wales (coached by Hossam ElGindy), 5 teams from the Macquarie University (with coach Mark Dras) and 4 teams from the University of Sydney (the coach is Bob Kummerfeld). Sarah, who is the chair of the ACM Student Chapter in the Sydney Uni, did most of the organization. She had also invited students from the Informatics Olympiad to partake in the competition informally. We had 2 of these students (and they are high school students) showing up on Saturday. We kicked off at around 12:10pm AEST and everything went well initially until 3:15pm. At that time, we had 2 teams finishing 5 questions and this particular high school team was doing exceptionally well (I think they came third at that time). But then disaster came. First, part of the database was corrupted. Then, the server kept going down in every 5 minutes. Though we were able see the teams submitting their code, the server was down and their submission was lost. Contestants started to queue outside the judging room to clarify if their submitted code has ever reached us and been validated. In the mean time, our technical staff worked hard and tried everything to keep the PC^2 alive, but with minimal success. The whole atmosphere became very tense and stressful, to the students as well as to the staff. At then end, we finished the competition at 5pm because it became almost impossible to do a decent job in such an environment. We asked the students to keep their files in the appropriate directories where we would grab them for analysis later on. I was told that we had a team who has done 9 questions, 8 of them were validated and correct, the 9th one was still to be judged. Our technical staff worked around the clock to get the files and pack them up for a proper investigation.